Our very own version of Oktoberfest was the perfect way to show our appreciation for our customers and to kick off Dreamforce. The Workato team suited up in some Lederhosen to really get into the spirit, complete with beer on draft, German music, Bavarian style sing-alongs, and amazing company! It was a fantastic way to meet in person with our customers and put a face to the name. A resounding thank you to everyone who made it! The sheer size of Dreamforce is something that will always be remembered! The conference did a fantastic job of making business fun, with great sessions during the day and a fun party environment elsewhere. There was ample live music, DJ’s, and people enjoying themselves. One Workato team member remarked that it was more crowded than New York City’s Times Square! We were thrilled to announce our comprehensive business suite featuring the best cloud apps that nonprofits use. The WINS makes it beyond easy for nonprofits to seamlessly integrate their apps with no coding knowledge or IT team. The recipes are ready to go on Workato and can be applied with the click of a button. Clicking that button means no more manually uploading data from your Eventbrite account to your Salesforce or CRM system or trying to organize your expenses and donations from Salesforce over to Quickbooks. To celebrate we released a series of articles by our CEO Vijay Tella chronicling the rise of cloud apps, which are the best for nonprofits, and why integration is a lifesaver (less time and money, more resources for your mission!). If you want to learn more about the WINS or get started, visit our nonprofit solution page. One of our favorite panels was the Q&A session with Salesforce CEO Marc Benioff and Co-Founder Parker Harris. 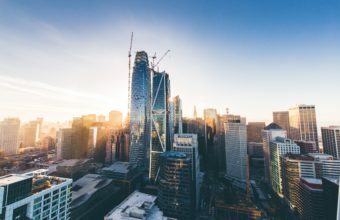 Harris addressed the issue of a general shortage of developers for Salesforce and the sentiment that Salesforce needed to do more to get more developers working on the Salesforce platform. While some projects and companies no doubt will require a seasoned Salesforce developer, many issues can be solved with simple integration solutions. Workato has the most robust Salesforce solution on the market – it can handle complex data mapping, conditional factors and any Salesforce customizations. Learn more about our integrations with Salesforce here. One of the most gratifying aspects of being at Dreamforce was the opportunity to meet new people and speak with them face to face about the integration space. We had a lot of people come up to us wanting to learn more about Workato – it was a great feeling! Just a casual, full-sized cruise-liner docked at Pier 27 all week! The view of San Francisco’s Bay from the deck was spectacular. One of the most awesome things to happen at Dreamforce was having two Salesforce MVPs mention Workato in their sessions! During the session AppExchange for Experts: Salesforce MVPs and Super-Users Share their Secrets, Jared Miller spoke about Workato, mentioning that it was one of the top 3 apps that he uses. We also got mentioned during the session Accelerate and Automate with Process Builder! There was a huge zone in Moscone West focused on helping people navigate around Salesforce with Trailhead. It’s a great way for people to learn about Salesforce, or learn to dive deeper into Salesforce. We jumped right into it and ended up winning an Astro toy from one of the challenges! Awesome! If you haven’t already heard, Workato integrates with any of the apps built on the Force.com platform! So if you’re an ISV and are looking for an integration solution, Workato is the answer! We’ll remember Dreamforce 2015 fondly. Until next year!